Indian River High School students and IRHS Leo club members Hannah Gentry, Ashley Morales and Hailey Hudson pose for a photo in the school. In order to be considered an active member, each student is required to volunteer in at least two events during the school year. Additionally, senior members who participate in at least two events during their senior year are eligible to receive a graduation cord to wear as they walk across the graduation stage on Tuesday, May 29. According to the club, most members volunteer in many more than two events over the school year and this year, two of the most active members, Hailey Hudson and Ashley Morales, are freshmen and they have each volunteered at more than seven events. 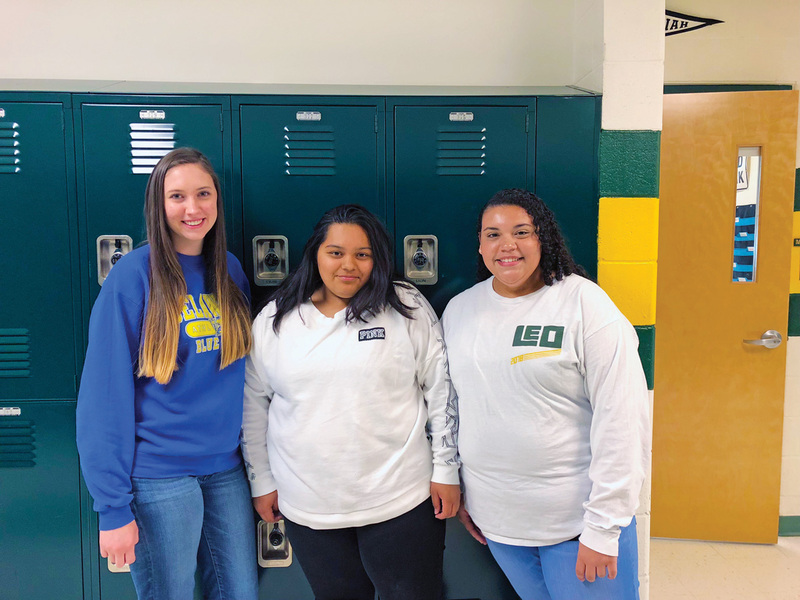 While Leo Club is different from other extracurricular activities, both girls agreed they were glad they decided to become members and plan to be members throughout their entire high school career. Year after year, the club is invited to serve in many of the same events. A few of the staple events are the Selbyville Halloween Parade, John M. Clayton and Lord Baltimore elementary school family nights, dinner for the visually impaired, and the Night to Shine dance for people with special needs. Additionally, the Leo Club was also able to assist the school’s student council with their Adopt-a-Family initiative in December, donating many gifts to local families. Some new events this year were Bethany’s Wags, Witches & Warlocks Halloween Parade, Selbyville Christmas Parade, Ocean City (Md.) Convention Center catering event and Dagsboro’s Easter Egg Hunt. The club was actually asked to help with the catering event due to their assistance at a Georgia House dinner fundraiser alongside a local nonprofit called Operation Shooting Star, which raises money to gain awareness for autoimmune diseases. Organizers of other community groups or events that could use volunteers next school year, can reach out to the Indian River Leo Club for assistance. The Indian River Leo Club is sponsored by the Fenwick Island Lions Club and receives assistance from them throughout the year in the form of support at the new-member induction ceremony, the Leadership Bash in the fall and scholarships to graduating senior members. The Leos, in turn, are able to assist them with their Spaghetti Dinner in the fall and their Pancake Breakfast at Harpoon Hanna’s in early June. This year’s Fenwick Island Lions Club Pancake Breakfast will take place on Saturday, June 2.